Things going well. In-tray has subsided slightly but still teetering. Thank goodness Hasbro cancelled Scrabulous. Spent some qwality time with Bumblebee tonight and saw The Clone Wars. LURV the Hutt take-off of Michael Jackson. Brilliant. Just thought I'd quickly mention that I'm on the Sydney Community Radio Station 2ser tonight at 7pm, on their Book Show, called Final Draft. It'll be podcasted in a couple of days. I'm not sure if I'm up to hearing it myself, but I might get brave. I always sounds a tad squawky (or is that quacky?). And very late last night, waiting for the PDFs to happen, I made the very airbrushed Manga version of myself above. Can't resist a challenge. The nose is much prettier than mine, and it's the hair I'm heading towards, not the hair I have now, but it'll do. Back to work. Missing you. I know I complain constantly about being busy, but I've reached a point where I'm having to make a few sacrifices. One of them is NOT this blog as such, but I won't be able to blog with any regularity at all for the next few months. The point of difference this time is that I have a huge looming personal deadline. Usually when I am busy, I shift things around a bit and everything seems to fit (just). This time I have a huge list of things to do and a brick wall to hit: in early November I am planning to have my womb removed and I will be forced to rest for AT LEAST six weeks. I'm not feeling bad about the womb -- no time, although I'm sure it will hit me sometime. I've crossed that first line of feeling sad and am just looking forward to the opportunity to do nothing but lie in bed and fend off the cats as they try to snuggle on my lap. I'm also looking forward to the holiday from femaleness, although if it all goes to plan and I have no complications, I will retain an ovary or two and that means I will not be free from PMT (poor BB) and I'll get a 'normal' menopause, whatever normal means in this increasingly bizarre universe. I'm also looking forward to the freedom from wanting babies and failing to achieve them. And no-one will be able to buttonhole me about not trying hard enough ever again (this is NOT BB, may I stress. He is completely supportive). So between now and blissful nothingness I have to complete three commercial academic book layouts, the cover for my next fine press book, get a group binding exhibition project underway, bind more copies of the last book, finish a book project I've been helping someone with, teach a few more workshops, hang around the School of Art Open Day (30 August, peoples), and a few other things, not least family commitments. It makes my brain hurt. So I will try to shove a picture up here every now and again, I will skulk about your blogs and occasionally comment, but I'm going to stop using that side of my brain (lovingly dubbed 'brian' by my dyslexic typing fingers) that spends a lot of the day thinking 'ooh, I must post that'. It'll be hard, but I console myself that when I'm able to sit at the computer post-op, I'll be blogging so much that your eyes will bleed. But for now, I'm cutting back. Oh, and that goes for Facebook games too. I will try to finish the games I have started, but when they finish, I'm not starting any more for a while. Sorry. -- I've been listening to a lot of Thao Nguyen. If you ever loved Edie Brickell before Paul Simon burst her bubble (I'm showing my age here, I know), then get into Thao. She's fabulous. -- I saw a bit of the Sydney Biennale the other day, on a uber-quick day trip with the art school. We just went to the NSW Gallery and Cockatoo Island. My favorite thing of all was William Kentridge, on Cockatoo Island, and if you do NOTHING else, see his work, it's frigging magical. I got very annoyed at a number of video artists who seem to think that they should be able to show videos longer than 10 minutes. All I can say is: get a film festival. Why should I spend 90 minutes with you when I have three hours before I have to catch a ferry back, and there are at least twenty other artists to spend time with? Tuh. -- I got my bike fixed up the other day, and they kept finding more things wrong with it ("we tested your chain for wear and it scored 99 out of 100"). By the time I got everything done, I might as well have bought a new bike. Still, it's now fixed, and it is FABULOUS. I'm shocked at how badly it was suffering before... poor thing. 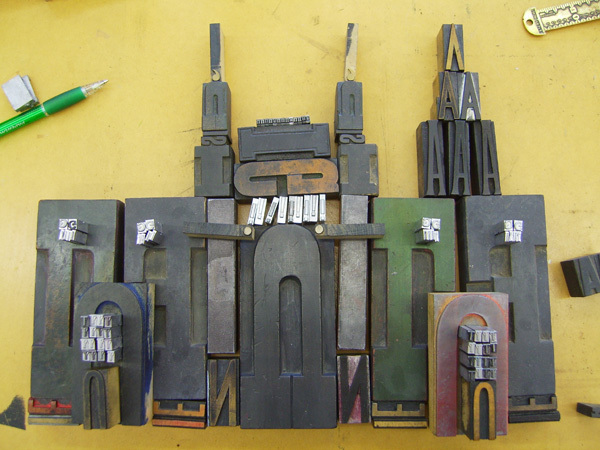 -- Snaps to my friend Lou, who came to me ages ago as a stranger wanting to start a letterpress stationery business and wanting to know where to buy the gear... I scoffed at the time, but look at her now! 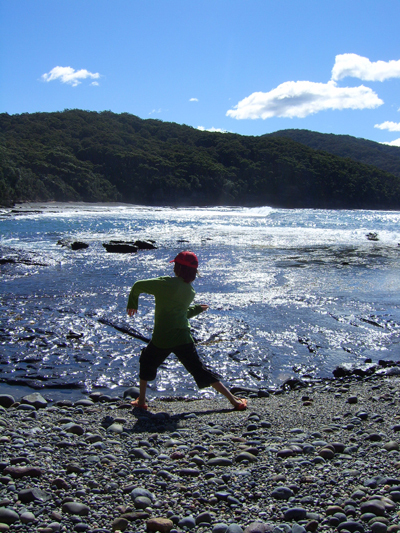 She's got a real feel for layering colours and varying pressure, and she loves the thrill of the chase (achieving that perfect print in the face of adversity, finding the equipment, etc)... I'm so impressed (sorry, bad pun). OK. Ciao for now. I probably won't be able to help myself, but I'm certainly going to try. This is the view from the bedroom window of our cabin. Unfortunately I took it at the wrong time of the morning so you miss the view right down to the beach. The trees on the right belong to the clearing where we got married. It's the same cabin as well... not an anniversary, just a favorite place. 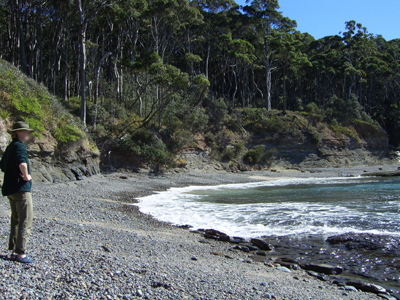 This is Depot Beach, as you walk down the path towards it from the cabin. The figures you can see are (not in order) Bumblebee, Best Beloved, Bernice Balconey and her lad, all playing piggy-in-the-middle frisbee on the sand. I joined in and spent quite a lot of time as piggy, because I am shite at frisbee. 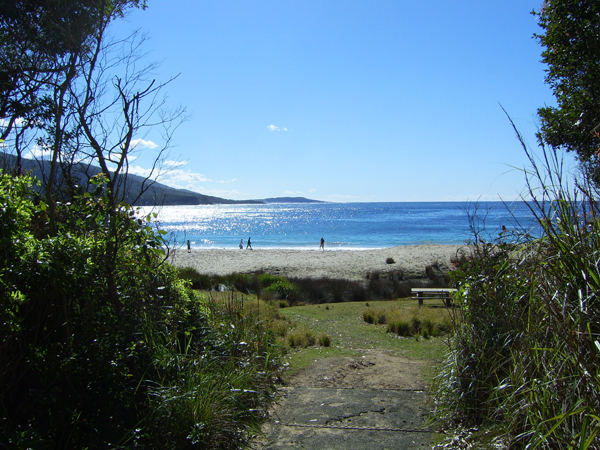 This is a rare sighting of Bernice, admiring the view from the neighbouring beach once we'd walked there. It's very confusing -- Depot Beach is 'next' to Pebbly Beach, which is a lovely sandy beach, but in-between the two is an extremely pebbly beach, made up of nothing but stones, but it's not officially Pebbly Beach. Please explain. This is the view she's looking at. This photo is revisiting this photo (a bit). 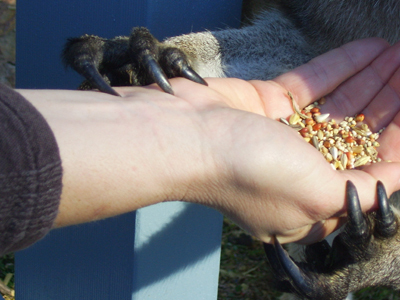 Feeding birds and kangaroos is a vital part of the Depot charm. Here is Bernice's young-un, about to lure a bird onto his arm by lifting his hand slightly. At Depot you can walk about pretending you're a pirate, with yer trusty parrot on yer shoulder. Arrrr! 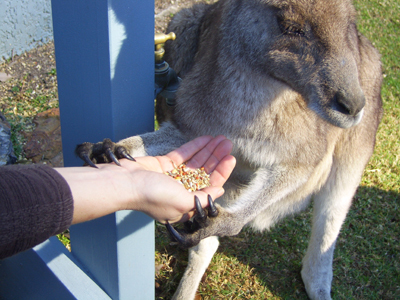 The kangaroos aren't shy either. 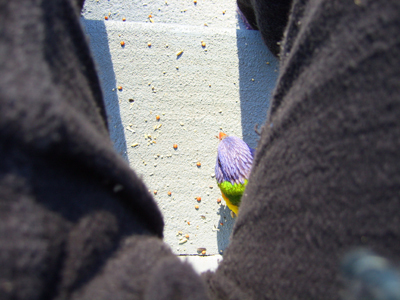 This one wouldn't let me go until she'd had her way with the seed in my hand. Let's have another look at those claws, shall we? Over a day later, I still have the claw indents on my wrist! Cheeky sod. So we ate well (very well), we drank well, we slept well, I read two complete books, and now I have NO EXCUSE. I am rested. For now. * My fab hairdresser and I are working on a plan to lengthen my hair (I am growing it, which is another entire blog post). When she asked me what I wanted next, I replied ' Russian Constructivist bob. Think Natalya Goncharova!' 'Wah? ', she said. 'Sigh. Cate Blanchett in the latest Indiana Jones movie.' 'AAAHHHH! OK!' she said. I still have too many layers to make it a proper bob, but it won't take too long to get it there. I found out only yesterday that Daniel McFadden died last week (I found out via a friend, then went straight to where I knew I'd find an internet link). 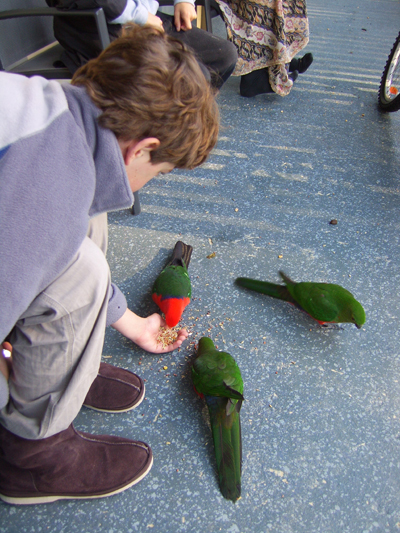 He was one of the people who provided Canberra's colour (and yes, to all ye unbelievers, Canberra has plenty of colour! Just subscribe to Culturazi and you'll get a glimpse), the person Kingston's pub Filthy McFaddens was named after, and someone I always stopped to talk to when I saw him in the street. 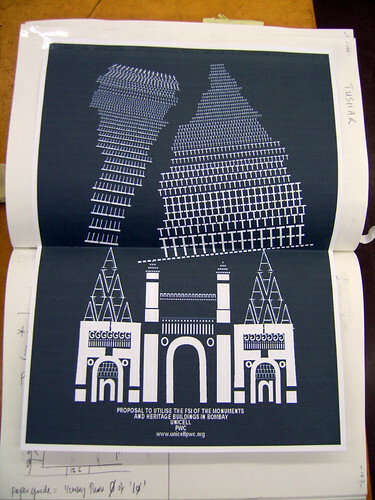 I bought a couple of his photocopied drawings and had a chat. I have a whole pile of his poems and drawings somewhere. Culturazi has started a small online gallery of things like that. Last week I found the DVD of The Devil and Daniel Johnston at JB HiFi and while watching it, thought about the similarities between this Daniel and that. Do follow the link to his life story. His funeral is today, but I can't make it. I'll just spend the day sending good thoughts over that way to his family and friends. It's at the heart of our legal justice system but is trial by jury always the best way of delivering just outcomes? Questionable behaviour by some jurors has seen two recent trials aborted. Two other extremely high profile cases are to proceed, despite the accompanying media hysteria. So are there particular cases when decisions should be handed back to the judges? And with the number of exemptions and exclusions, does the jury still represent trial by peers? It was quite interesting, and covered things like the theory of what to wear if you do or don't want to be picked for jury duty, the lack of incentive to actually do your civic duty, and the fact that when they re-established jury duty in the Russian Federation, they decided to pay jurers as much as the judges. Today Best Beloved had to front up to the ACT Supreme Court to take part in jury selection. All week he's been deliberating on what to wear: the Donny Darko t-shirt and tracksuit pants? Jeans and a flannie shirt? Tuxedo? In the end he wore one of his work suits and shirts, but added a burgundy bowtie embellished with tasteful gold gryphons. With his current neatly-clipped beard, he looked like a Professor of Norse Mythology or something. Right, they even got the time wrong. Now waiting in a scummy room. I can feel a wall of antipathy, which I ascribe to the bow tie. I do not recognise anyone, fortunately. I wonder if some are thinking that they should have donned something ludicrous. I'm number 58, whatever that means. The sheriff sounds a little like Fozzie Bear, which is worrying. No he's not the sheriff, just a court officer. Now someone is making up stories about why they shouldn't have to attend. There's an urn in the corner with instant coffee and Lipton's teabags. I hate to think what the lunch will be. If it comes to it, I might tell them that I only eat certified Kosher vegan organic food. Now some people are giggling. Now a man with a dirty checked scarf is pushing in. There's also a screen and a projector. I can only assume that we will be shown some educational video about the justice system. I hope there is a question time. Oh, the video is on. It's out of focus, and they have not turned off the lights, so you can only see the white bits. No Oscars for the actors. They turned off the lights, so I had to stop writing for a while. I was interested to note that the all the actors were white, and the fictitious criminal had an Irish name. I also knew one of the fictitious jurors, so I might have to be excused. Each person who spoke in the video (other than the lawyers and judges) claimed to be public servants. They are now having technical difficulties, so we are all sitting round waiting, and have been for half an hour. The court officer has now told us that the courthouse was built in 1963, which is the explanation for the technical difficulties. Dr Who dates from 1963, and he doesn't have these problems. There are people coughing. I hope I do not get infected. Really getting very bored now. And still no apology for the balls up with the phone message and the web address. Apparently the technical hitch is the the CDs. What CDs? I hope they play some Twisted Sister. And it's DPP's fault. I've been reading my book, but even that is boring. The court officer is now instructing the potential jurors in how to defraud the court by claiming parking expenses of $15 and then taking the bus. Now's your chance to get out of there - ask him if that's ethical. In the end, they'd selected the jury before they'd got to him. He went happily back to work, but has to return on Monday for another fascinating insight into our local legal system. While I was at court the chaps printed off some “CRIME SCENE—DO NOT CROSS” ribbons and put them across my door. It's so The Office it makes me giggle. He loves the thought of being popular with 'the chaps'. Jolly japes! 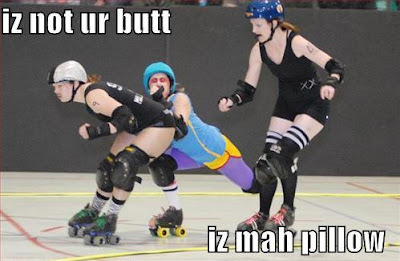 Ellis Hutch has pointed me to a new use for LOLz: Roller Derby! Ellis is valiantly attempting to bring Roller Derby to Canberra. I missed the initial meeting and haven't found out how it went -- I dream of being back on my skates, but I seem to miss every opportunity (thanks to my printing obsession), and with the way my body is creaking and groaning, I fear I will be shite at any skating revival. My skates -- black and red soccer boot style -- are in the shed, wistfully waiting. Sigh. Forgive me for any vaguenesses I am about to commit; I am chronically underslept and overworked, and all that is keeping me awake is the thought that in four (four!) 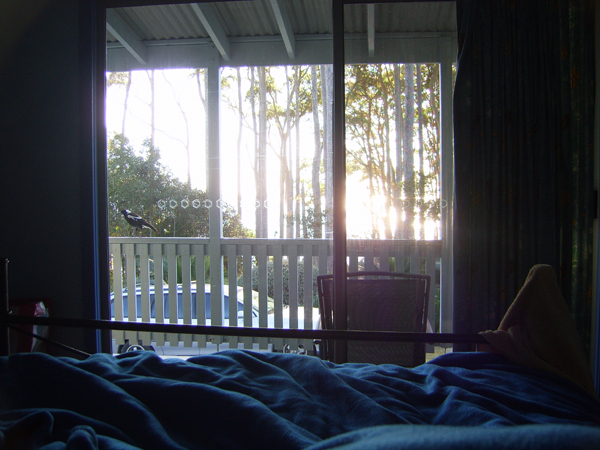 sleeps I am going to the south coast of NSW to a rented beach cabin to do nothing but eat, sleep and wade. Holding that thought is wonderful. Where was I? Let's start with Thursday week ago. I'm introduced to Indian artist Tushar Joag, who is the Chief Executive Officer of the naughty anti-establishmentarian corporation Unicell. Tushar was visiting Canberra and the Art School for ten days to install a hand-drawn piece for the human rights exhibition Recovering Lives. 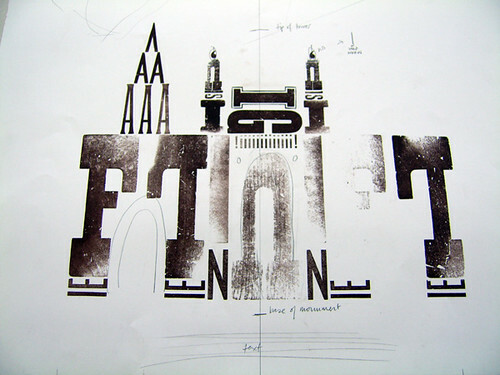 I offered to do a collaborative piece with him using letterpress (fake certificates or something). Tushar was keen and goes away to think about it. Tushar and I met up at the Book Studio to discuss our project. 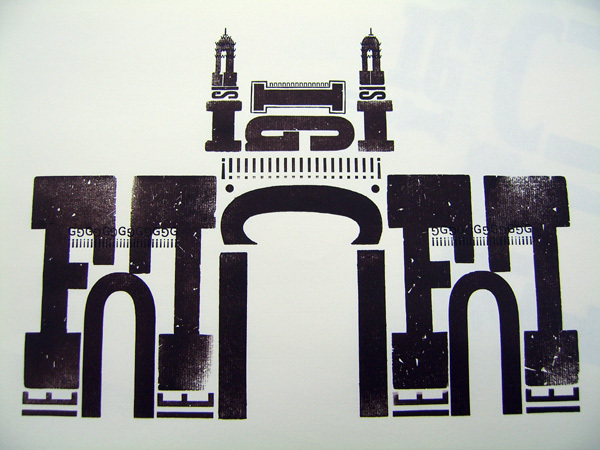 Tushar rightly pointed out that he could manufacture false certificates with an inkjet printer, and would like to utilise the letterpress more creatively. 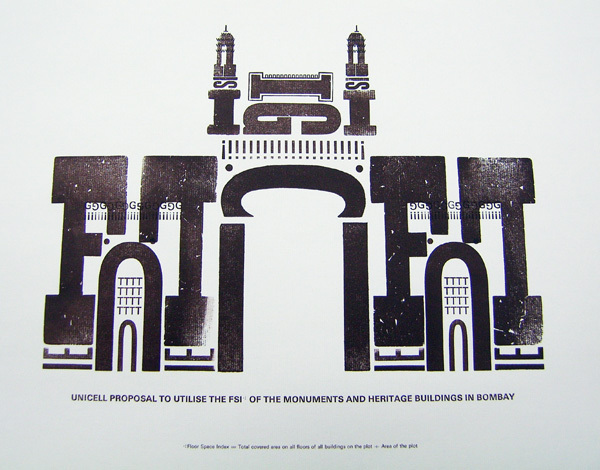 He showed me his idea, which ties in with his Monument work. 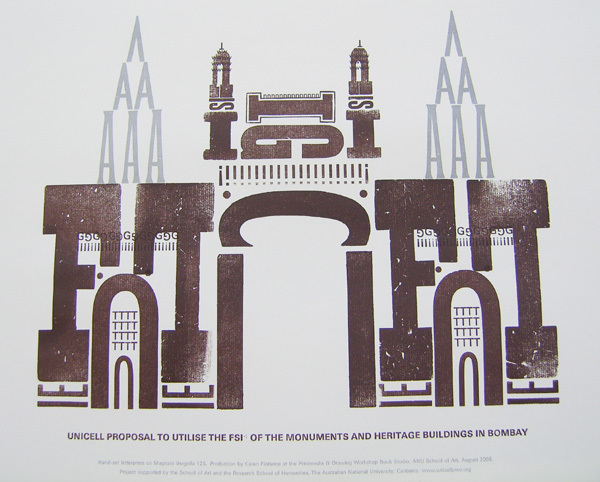 It's a piece that talks of wasted urban space, and ways to make good use of silly things like the valuable Floor Space Index over rotting old memorials, and involves recreating the Gateway of India Monument in Bombay using letterpress. It looked very complicated, but so interesting that the enthusiastic right side of my brain crash-tackled the dubious left side of my brain and I started planning how to make it possible. 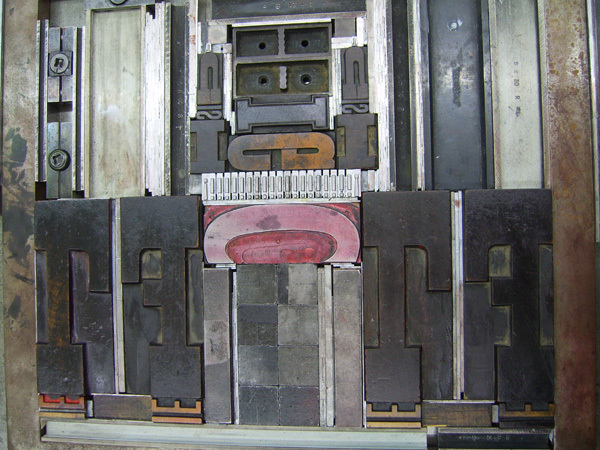 My first mock up looked promising, but it brought home the fact that to make it work, I had to do a number of passes of the press; you can't inlay one letter inside or on top of another, because they are solid blocks. I started calculating [numbers of layers x amount of time available] and thought that I could just wing it. And we decided we were happy. Full steam ahead. I set and printed whilst Tushar worked down in the gallery, drawing directly onto the walls with chinagraph pencil and solvent to make huge graphic novel panels. He did the [number of panels x amount of time available] calculation and also thought he could just wing it, albeit with some student help. 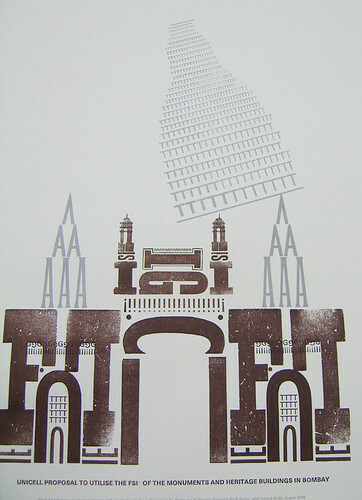 I started with an edition of 50, which decreased as I bugger up. 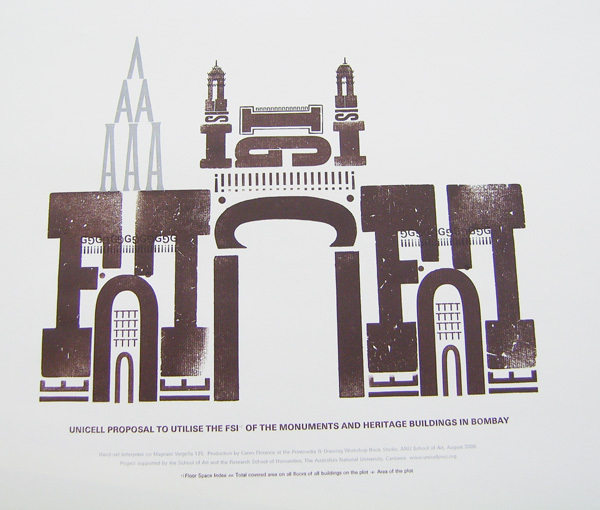 In the morning I found time to record an interview with Sydney community radio 2ser's book program about The Lost Dog and other bizarre things I get up to, including setting the Gateway of India Monument in wood type. I'll let you know when it airs (I think I gabbled too much, but never mind). Sixth pull -- large hypothetical structure. This took a while to set, but then had to be reshaped a bit to attempt to make it less temple-like, which took a slab out of the day. 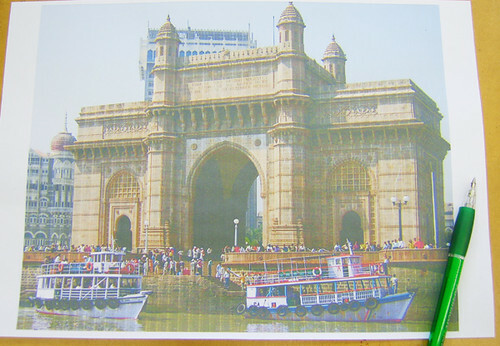 Tushar and I managed to print this together minutes before his exhibition opening (we didn't have to use the print for the exhibition, thankfully!) and then we both went down and ate our bodyweight in gorgeous cheese and passable wine (actually, I stuck to the bubbly water, because there was still a lot to do). Afterwards I dashed home for some dinner and then came back to set and print the very last bit. I couldn't work on Friday or the weekend due to other commitments, and Tushar was leaving on Sunday, so it was crunch time. Then I ran home, threw lots of relevant stuff into boxes and bags and jumped in the car. I swung past B's school and picked him up, then we hit the highway for Sydney. Halfway there I threw him out onto the highway for his dad to scrape off dropped him off to his dad and kept going. I reached my lovely hosts at their magnificent Enmore residence at about 6.30, in time to hear the cork pop. Le puff! Le pant! 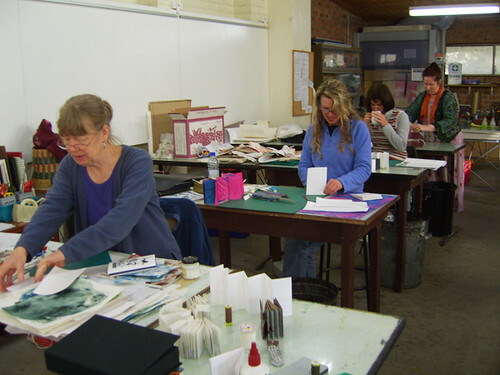 Print to Book Workshop, Warringah Printmakers' Studio, day one. This was a lot of fun. I spent a lot of time talking about the work I'd done, both personal and collaboratively, I showed lots of examples of books as artworks, and then I encouraged the participants to think about ways that they could use their prints to create both artist's books and in more traditional book techniques. 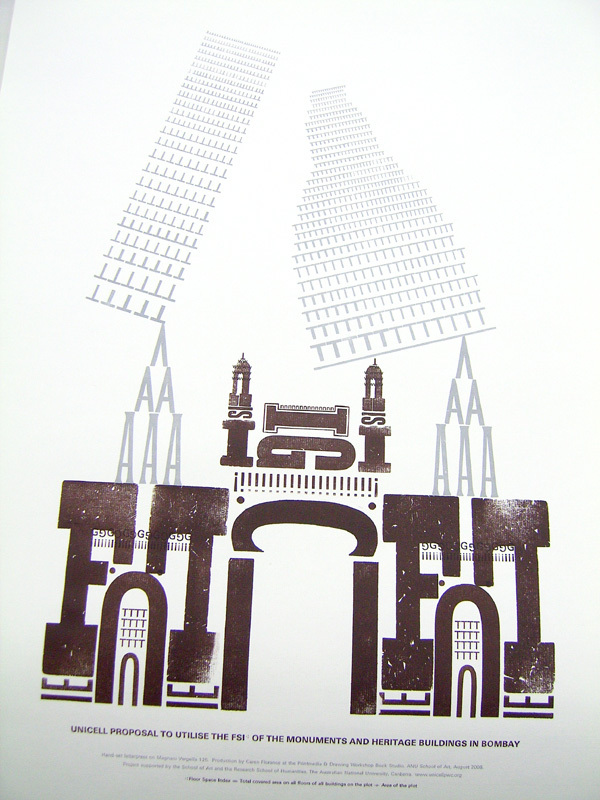 I armed them with a variety of techniques, and let them loose on their own prints. I think we all had a great time. 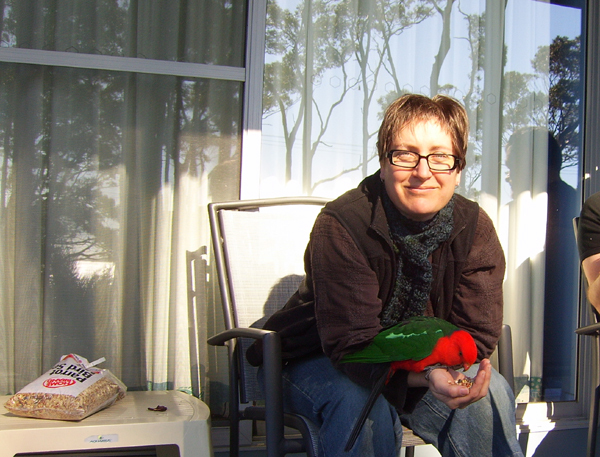 The workshop co-ordinator, Susan, had given me a lift from Enmore that morning, but I wanted a bit of fresh air, so she dropped me at Manly in the afternoon after class, and I bought a lemon gelato, donned the ipod and caught a ferry back to the city, and then a bus back to Enmore. I love that trip from Manly to Circular Quay, not least because I get to gaze lovingly at the Macquarie Lighthouse and think about the time we lived next door to it in the (Army-rented) stone lighthouse-keeper's house. I realised with a shock, as I looked and thought, that next week is my brother's deddiversary, and that this was a fabulous time to be gazing at the house lovingly, since that's where I have a mental picture of him when I do think about him (did that make sense?). Once back at the hosty house, we all headed up to the Warrenview pub for a clandestine blogmeet with Harry (whom I have met, reasonably often) and Speedy (World Peace and a Speedboat), whom I have never met and have often been encouraged to meet by the other members of For Battle. We spent a lot of time laughing, and my hosts liked my blog friends very much. A lot of time laughing, except when Speedy and I did Teh Girly Bonding with stories of bad exes and sweet children. Every now and again we surfaced to find the others roaring over things like Harry's testicular modelling or Brad's strange costumed historical re-enactments. Speedy gave me a CD of The Church's Box Full of Birds. I was embarrassed to admit that the only CD I had in my backpack was the Greatest Hits of Hall & Oates, thanks to Bumblebee's latest obsession brought on by watching The Wedding Singer. We decide that I will send her some (now rare) Arty Fufkin. We retire to the hosty Mansion and eat wonderful Turkish pizza until host Brad and I tripped over our eyelids and forced the others out onto the street, still laughing. Fun. Sorry I couldn't catch up with more peoples, but I didn't have the energy to organise anything else than what Harry organised. It was really so nice to just talk to a few people after gabbling on all day. 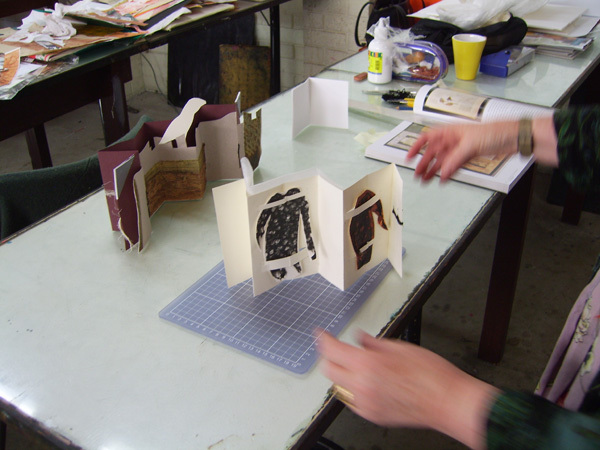 Print to Book Workshop, Warringah Printmakers' Studio, day two. Goodness me, more gabbling. And looking. And making. These people went nuts. Good things were made. Fun was had. Rain poured down. The City to Surf came and went, apparently with casualties. And then, sooner than expected, it was time to go home. I stopped halfway home to scrape Bumblebee off the road outside the truck weighing centre pick up Bumblebee, then we went to a Retailer of Fried Foods and bought a very greasy and salty dinner to keep us awake and on the road. We got home to Chez Duck about 9.30pm. 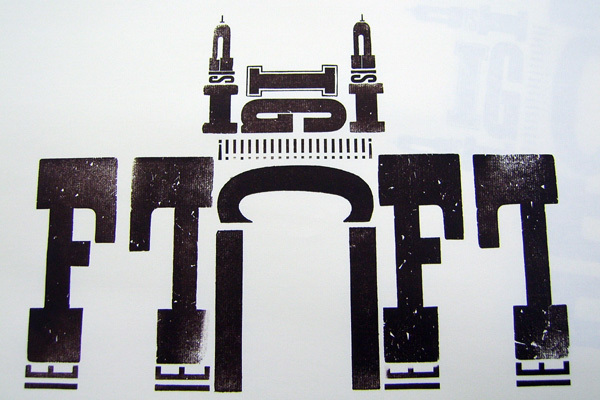 Let the students loose with the letterpress. No-one was fatally injured. Hooray! Got some way through cleaning up the Tushar mess. Fought the eyelid droop. Came home. And here we are. And I haven't seen or heard a single second of the Olympics. Don't want to, neither. I'm still here, believe it or not. There's a lot happening. But I'm doing interesting things, for the most part. I'm taking photos. When I can mount them is anybody's guess. I'll leave you with a random thought.